Doing your homework is an important part of planning your barn. There’s no better way to research what works and what doesn’t than to go visit existing horse barns. Call up your friends and network to visit local barn owners. During your visit, take a walk through the barn and the property. Talk with the barn owners about their experience in building the barn – what did they plan ahead of time, what problems did they run into, and what do they wish they’d done differently? Finding out what aspects of the barn they like and wish they could change can better inform your own barn building planning. While you’re visiting local barn owners, ask them about people they would recommend to help you with your project. Many barn owners will have strong recommendations for architects, contractors, and even supply companies where you may find lumber and other building products. 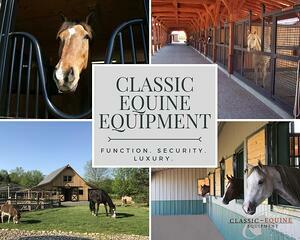 You are also welcome to contact us at Classic Equine Equipment. Because we work on projects all over the county, we’ve worked with a wide variety of barn builders and may be able to recommend one located in your area. Once you have references, don’t forget to check them. If you’re checking references for a contractor, it’s a great idea to go and see some of his previous projects in person. Of course, make the time to call up the references that he’s provided to find out more about what the experience of working with him was like. Check out some our our recent projects. Have you paid your state agricultural department a visit yet? If not, now is the time to start. Your state agricultural department offers a wealth of information which is relevant to planning your barn. State agricultural departments can provide you with information on agricultural regulations, irrigation methods, pesticide programs, alternative energy technology, and more. There is a wealth of information important to all horse owners - pasture management, manure and mud management, water management and more. The department can help to connect you with the resources that you need, and may even have recommendations for services local to you. While local resources can provide you with key support as you plan your barn, we’re also here to help. 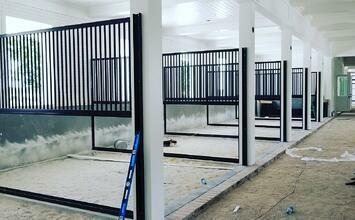 Contact Classic Equine Equipment at any stage during your barn building process (though the earlier in the process, the better), since we would love to help you make your dream barn into a reality. 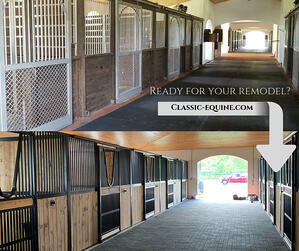 We can also give you detailed information about our horse stalls and barn accessories for your planning purposes.